The stormy weather pattern is forecast to continue, while temperatures are likely to flip back and forth from mild to cold in the eastern United States during much of December. Expect several storms with the potential to disrupt travel and shipping from now through Christmas. While no long-term frigid conditions are forecast, prolonged abnormal warmth is also not likely in the East. In the short term, one storm will move from the southern Rockies late this week to the Upper Midwest this weekend. The storm this weekend has the potential to bring another blizzard to part of the Central states, but mostly likely farther north than last weekend’s storm. Except for a chance of spotty ice at the onset in the Appalachians and a wintry mix in the northern tier, the storm this weekend will bring mostly rain to the Northeast, with the potential for strong to severe thunderstorms in the South. 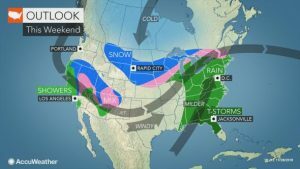 “There is the potential for a swath of snow or a rain and snow mix from the Ohio Valley to parts of the central and southern Appalachians, upper mid-Atlantic and southern New England areas, spanning Tuesday to Wednesday of next week,” according to AccuWeather Senior Meteorologist Bernie Rayno. “The idea of a third storm is gaining momentum before the middle of the month,” according to AccuWeather Lead Long-Range Meteorologist Paul Pastelok. “That third storm spanning Dec. 7-9, could pack a punch in terms of heavy rain in the South and along the immediate Atlantic coast with the poential for heavy snow inland,” Pastelok said. “During the period from Dec. 10-20, the number of storms may decrease and/or the overall size of the storms may be such to affect a georgrapical smaller area,” Pastelok said. “The lull in storms is not likely to last through Christmas or even the days leading up to Christmas as the jet stream pattern looks to remain quite active due to El Niño,” according to AccuWeather Long Range Meteorologist Max Vido.